As many of you know, I bought some land surrounding the Herring flagpole in Iowa last year. The flagpole was raised in the rural Iowa community of Herring on Armistice Day, November 11, 1918, to celebrate the end to the final and greatest war the world had witnessed up to that point in history. Herring, Iowa was one of these little railroad towns that included a train depot, a livestock loading facility, a general store, creamery, blacksmith shop, lumber yard, barber shop, pool hall, bars and a dance hall. 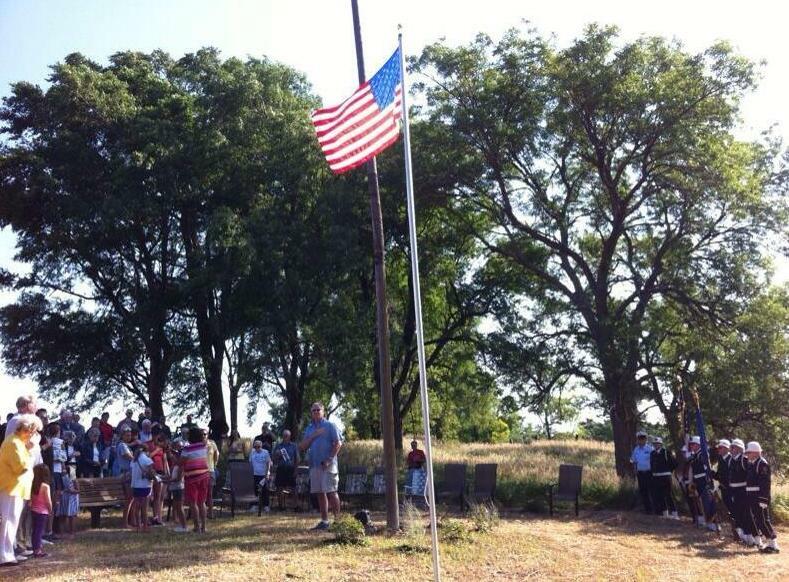 Today all that remains is the Armistice Day flagpole in a field in Iowa. 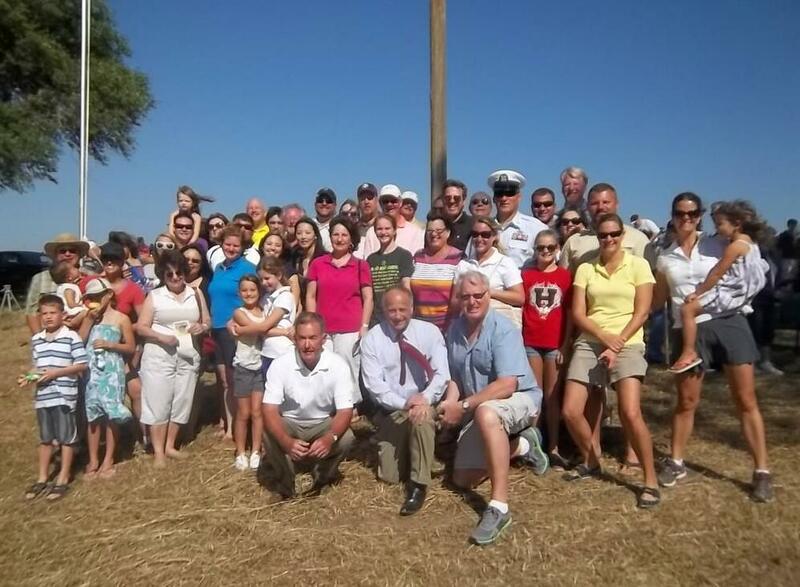 Last Friday, the descendants and friends of Herring gathered on the hill and, with the help of Rep. Steve King, who grew up in the area, we re-dedicated the Armistice flagpole. Several local reporters attended the event including the Tim Gallagher from The Sioux City Journal. Tim wrote a wonderful article on the event and posted several pictures including this one. I got such a kick out of this photo. 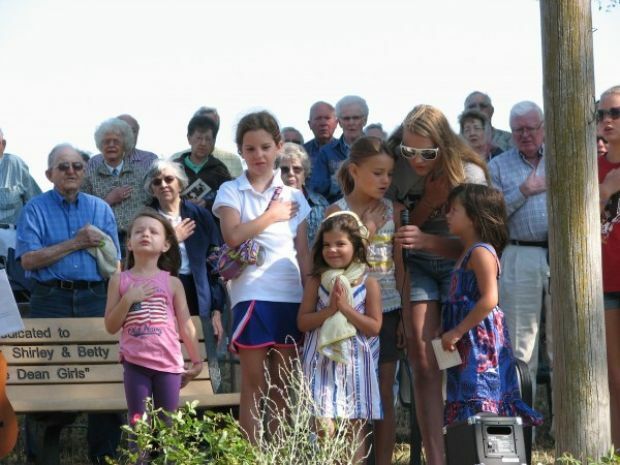 The little girls were asked to lead the townsfolk in the Pledge of Allegiance. My little niece Cece, who is close to 4 years-old, didn’t know whether to pray or pledge, so she did both. Cece and other girls pictured are all my nieces. From the picture above: That’s Aleyna in the US flag shirt with her hand on her heart, then Mia, then little Cece, then sisters Anna and Maddie with the microphone, then Sophie and Lily over to the right in the red shirt. We took a group family shot after the event. Rep. Steve King (R-IA) and County Supervisor Dean Stock posed for a photo with the descendants of Ralph Dean – who ran the Herring grocery store. Singing the Star Spangled Banner at the Herring flagpole dedication. We can’t thank Rep. Steve King (R-IA) enough for joining us on top of the Herring Hill on Friday. Rep. King gave a wonderful speech and, in his usual style, stuck around talking until nearly everyone had gone back home. Rep. King issued this press release later on Friday.